A mild-mannered man journeys across a post-apocalyptic landscape in search of answers regarding a derelict spaceship hovering in the sky. Lost during a scavenging run, a marauder dressed as a Nazi acquires Candy’s Teenage Mutant Ninja Turtle necklace. The Nazi later attempts to sell the trinket to a shady Shop Keeper. Candy brings home a Christmas fir for Birdy. Birdy mentions that the ball return has been activating on its own and suggests that the derelict spaceship hovering in the sky may be powering up for an unknown purpose. To learn more about what may be activating the magnetic fields, Candy resolves to return to the wasteland and visit the witch for information. To prepare for his journey, Candy and Birdy pray at an altar dedicated to Michael Jordan. Birdy arms Candy with a plastic sword that is later stolen by a marauder on horseback. The marauder then pawns the sword to the Shop Keeper. Candy visits the witch and attempts to pay for her prophecy with Michael Jackson’s “Dangerous” album. The witch refuses the record, saying that Candy will need it for his wedding, and makes him do labor for her instead. Candy tells the witch that he needs to find Santa Claus, who the witch divines is in a dark hole in the old city. She advises that Candy follow the train tracks to find Santa. Meanwhile, Birdy begins seeing Santa Claus inside the ball return. Candy gives the witch the Michael Jackson LP anyway, which she later pawns to the Shop Keeper. Candy encounters other survivors on the next leg of his journey and comes to believe that he is destined to birth a child who will become king of the stars. Birdy dreams the same thing. A nativity scene figurine Candy leaves behind after receiving as a gift is later found and pawned to the Shop Keeper. Santa Claus becomes frustrated that Birdy will not speak to him or divulge what she wishes for. Candy eventually finds Santa Claus in an old zoo. Because Candy believes he may be alien, Candy tells Santa that he wishes to board the spaceship so that he can return to his own planet. When Santa refuses Candy’s wish because it did not come in the form of a letter, Candy and Santa Claus have an argument that ends with Santa beating Candy with a bicycle. Birdy sees the assault through the ball return and wishes to have Candy back. Santa insists that Candy’s return is not Birdy’s true wish. After a goat head comes out of the ball return similar to one found beside her in bed earlier, Birdy prays again at the Michael Jordan shrine. Candy regains consciousness and leaves the zoo. Candy meets a blind projectionist at an old theater and watches a Superman movie. The projectionist insists that Candy stay, but Candy discards his own Superman shirt and returns to the wasteland. Birdy dreams of she and Candy spinning on a carousel. The couple professes their love for each other as Candy gives Birdy an item to pass along to their child. Meanwhile, the spaceship leaves Earth. 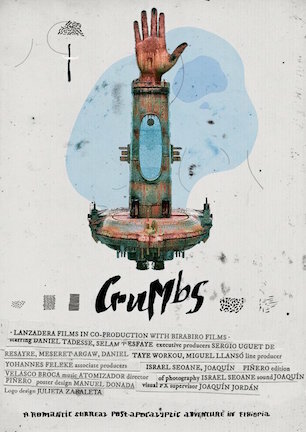 Subtly surreal Sci-Fi/Adventure/Fantasy/Romance/Mystery amalgamation “Crumbs” marks the first movie I have ever seen in Amharic, which I bashfully confess is a language I forgot existed. Amharic is spoken in Ethiopia, which is the post-apocalyptic setting where misshapen misfit Candy spends his days scavenging and his nights sheltered in a derelict bowling alley with his fiancée Birdy. When a long-dormant, arm-shaped spaceship hovering on the horizon begins humming with magnetic activity, the odd couple senses strange changes afoot in their quirky wasteland. So Candy braves the desolate landscape in search of a prophetic witch to divine the fate of his journey and Santa Claus to grant him a wish for a purposeful future. A beneficial boon to the African backdrop is that its casual unfamiliarity in the mind’s eyes of many lends itself to an already alien environment. Natural gnarls in rock formations and rusted ravages of manmade machines combine for concurrent beauty and sadness in creating an environment conveying neglect and underappreciation. Simple science-fiction has little need for elaborate sets or ambitious production design when visual textures of a seldom-seen locale inherently permit the palette to pop. Channeling a “Gods Must Be Crazy” theme, currency in Candy’s world comes from repurposed remnants of a forgotten pre-war past. A necklace fashioned from a Teenage Mutant Ninja Turtles toy is a treasured relic of historically revered warriors. Michael Jackson’s “Dangerous” album is a highly coveted artifact, though not nearly as much as a plastic toy sword forged by legendary craftsman “Mattelo.” And before adventuring into potential danger, Candy and Birdy both pray for blessings from Michael Jordan, whose protruding-tongue photograph comprises the centerpiece of a deifying shrine. By taking pop culture symbols out of commonplace context, “Crumbs” skewers the ridiculousness of idol worship with thoughtful humor. Imaginary importance once assigned to figures of fleeting stature has confused the future into honoring Stephen Hawking and Justin Bieber with equal significance. Taking the title literally, crumbs are leftover remains. In a case such as this, sometimes the things that stay behind aren’t necessarily the things that should survive. Before biting the end of your eyeglasses and stroking your chin to chew on metaphorical meaning behind seeming symbolism, writer/director Miguel Llanso has a confession to make. At a post-LAFF 2015 screening Q&A, Llanso revealed that “Crumbs” was built chiefly on circumstance and happenstance. If the film reads, sounds, or comes across as often chaotic, confusing, confused, or incoherent, that is because it is. Fascinated mainly by faces and places, Llanso dispenses with traditional story structure and cinematic conventions to favor experimental flair and artistic indulgence. Working less from a complete script and more from a disposable outline, “Crumbs” constructs itself with fluidity based on what seemed interesting in the moment. Llanso had a preconceived list of abandoned buildings he found aesthetically appealing and worked ideas from there. Casting was conducted by literally taking to the streets and searching for regular people bearing unique looks. If anyone had difficulty reciting lines, then that dialogue was cut. The inclusion of Santa Claus? That actor’s white beard reminded the filmmaker of Saint Nick, so Llanso thought, why not slip the fictional figure into the movie somehow? It can be debated whether or not organic serendipity is a sensible way to make a movie. There is less of argument to be made that whim-based script changes influenced by facial hair are preferable for telling a cohesive tale. “Crumbs” is a movie that fearlessly invents its own everything. Its own fiction. Its own logic. Its own cinematic language. “Crumbs” also has an oddly enigmatic lead in Daniel Tadesse, who is extraordinarily likable as a meekly quiet, unlikely wasteland hero. One thing “Crumbs” does not have however, is a story with defined purpose as entertainment or as art. Not a narrative, “Crumbs” is an interpretive arthouse indie incarnation of a post-apocalyptic romantic drama; the kind of film festival fare that armchair academics champion as a refreshing thinkpiece. Consider it the movie equivalent of a blank canvas hanging in a modern art gallery, intentionally vexing so as to inspire analytical discourse. Like that empty frame, “Crumbs” is whatever you choose to make of it. Where one contingent shrugs shoulders at a plain white space, another insists on seeing ghosts eating marshmallows in a snowstorm. “Crumbs” earns a noncommittal midrange score of 50/100 because I don’t have the heart to go lower, and don’t appreciate artistic ambiguity enough to go higher. Breezing by at just 68 minutes, “Crumbs” features a lot to admire, and plenty to ponder, perhaps pointlessly. Yet I cannot recommend it because I cannot discern for whom this film is intended, or to whom it might appeal. Disbelieving in movies preconceived in one’s head, Miguel Llanso has created a nontraditional, unconventional film unlike anything seen before. But to achieve what end, I’m not sure even he can say. June 19, 2015 by Ian Sedensky.